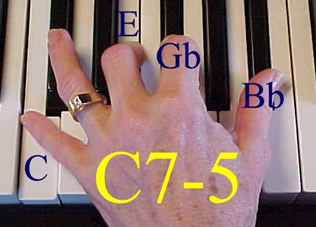 So far we've covered chords from major to minor to diminished to augmented to 6ths to 7ths to maj7ths to 9ths to 11ths to 13ths -- and last time we covered suspensions. 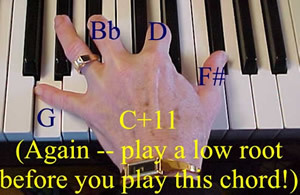 I trust that you have been MASTERING each chord type as we've gone along. 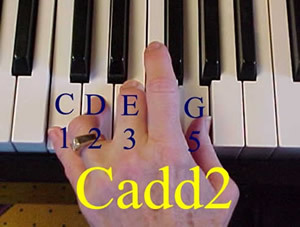 We're almost through -- almost to the point where we can apply what we've learned about chords to chord progressions -- and that's where the fun begins. But it won't be much fun if you can't remember the chords you've learned, so keep going over and over and over them. Did you figure it out? 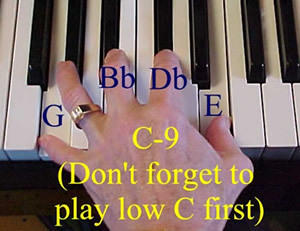 Don't feel bad if you didn't -- it's a C+9. 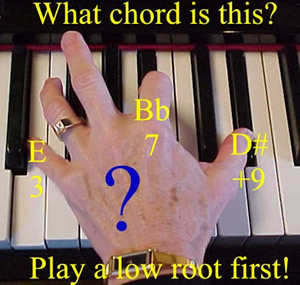 You would play a low root (C) first and hold it with your sustain pedal, then play this chord, which is in first inversion. 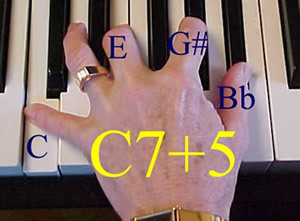 This is an advanced voicing -- we're leaving the 5th of the chord out, so we have a "stack of 4ths," which creates an open sound. Now that you know what it is, try it. That's enough for this time. I don't want you to get "musical indigestion." Next time we'll take a look at "slash chords" and see what they are made of, and then after that I think we're ready to being learning about the wonderful & exciting world of progressions -- the path chords take as they move from one to another. This page updated on March 25, 2019.